I have already presented my views on the relative patent risk of WebM, based on my preliminary analysis of the source code and some of the comment of Jason Garett-Glaser (Dark Shikari), author of the famous (and probably, unparalleled from the quality point of view) x264 encoder. The recent Google announcement, related to the intention to drop the patented H264 video support from Chrome and Chromium (with the implication that it will be probably dropped from other Google properties as well) raised substantial noise, starting with an Ars Technica analysis that claims that the decision is a step back for openness. There is an abundance of comments from many other observers, that mostly revolve around five separate ideas: that WebM is inferior, and thus it should not be promoted as an alternative, that WebM is a patent risk given the many H264 patents that may be infringed by it, that WebM is not open enough, that H264 is not so encumbered as not to be usable with free software (or not so costly for end users) and that Google provides no protection against other potential infringing patents. I will try, as much as possible, to provide some objective points to at least provide a more consistent baseline for discussion. This is not intended to say that WebM is sufficient for the success of HTML5 video tag – I believe that Christian Kaiser, VP of technology at Netflix, wrote eloquently about the subject here. 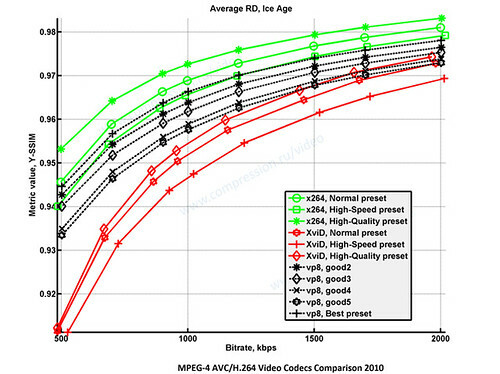 What this graph shows is the relative quality, measured using a sensible measure (not PSNR, that values blurriness more than data…) of various encoding done with different presets, with x264, WebM (here called VP8) and Xvid. 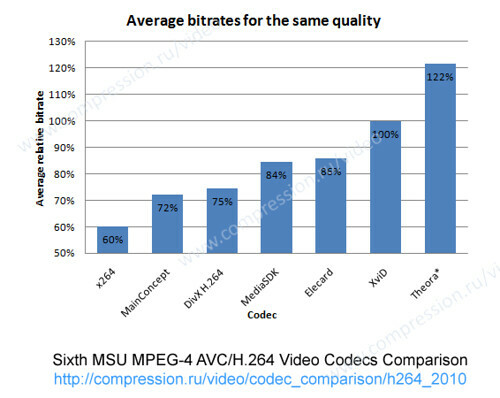 It shows that WebM is slightly inferior to x264, that is it requires longer encoding times to reach the “normal” settings of x264; and it shows that it already beats by a wide margin xvid, one of the most widely used codecs. Considering that most H264 players are limited to the “baseline” H264 profile, the end result is that – especially with the maturing of command line tools (and the emergence of third party encoders, like Sorenson) we can safely say that WebM is or can be on the same quality level of H264. WebM is a patent risk: I already wrote in my past article that it is clear that most design decisions in the original On2 encoder and decoder were made to avoid preexisting patents; curiously, most commenters used this to demonstrate that WebM is technically inferior, while highlighting the potential risk anyway. By going through the H264 “essential patent list”, however, I found that in the US (that has the highest number of covered patents) there are 164 non-expired patents, of which 31 specific to H264 advanced deblocking (not used in WebM), 34 related to CABAC/CAVAC not used in WebM, 16 on the specific bytecode stream syntax (substituted with Matroska), 45 specific to AVC. The remaining ones are (to a cursory reading) not overlapping with WebM specific technologies, at least as they are implemented in the libvpx library as released by Google (there is no guarantee that patented technologies are not added to external, third party implementations). Of course there may be patent claims on Matroska, or any other part of the encoding/decoding pair, but probably not from MPEG-LA. WebM is not open enough: Dark Shikari commented, with some humor, of the poor state of the WebM standard: basically, the source code itself. This is not so unusual in the video coding world, with many pre-standards basically described through their code implementations. If you follow the history of ISO MPEG standards for video coding you will find many submissions based on a few peer-reviewed articles, source code and a short word document describing what it does; this is then replaced by well written (well, most of the time) documents detailing every and all the nooks and crannies of the standard itself. No such thing is available for WebM, and this is certainly a difficulty; on the other hand (and having been part, for a few years, of the italian ISO JTC1 committee) I can certainly say that it is not such a big hurdle; many technical standards are implemented even before ratification and “structuring”, and if the discussion forum is open there is certainly enough space for finding any contradictions or problems. On the other hand, the evolution of WebM is strictly in the hand of Google, and in this sense it is true that the standard is not “open” in the sense that there is a third party entity that manages its evolution. H264 is not so encumbered-and is free anyway: Ah, the beauty of people reading only the parts that they like from licensing arrangements. H264 playback is free only for non-commercial use (whatever it is) of video that is web-distributed and freely accessible. Period. It is true that the licensing fees are not so high, but they are incompatible with free software, because the license is not transferable, because it depends on field of use, and in general cannot be sensibly applied to most licenses. The fact that x264 is GPL licenses does not mean much: the author has simply decided to ignore any patent claim, and implement whatever he likes (with incredibly good results, by the way). This does not means that suddenly you can start using H264 without thinking about patents. So, after all this text, I think that there may be some more complexity behind Google’s decision to drop H264 than “we want to kill Apple”, as some commenters seem to think – and the final line is: software patents are adding a degree of complexity to the ICT world that is becoming, in my humble opinion, damaging in too many ways – not only in terms of uncertainty, but adding a great friction in the capability of companies and researchers to bring innovation to the market. Something that, curiously, patent promoters describe as their first motivation. 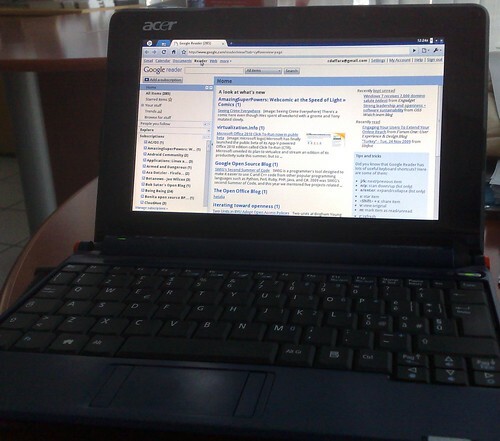 Finally, after much delays, Google has presented its second operating system after Android: ChromeOS. Actually, it is not that new- developers already had full access of the development source code, and I had already the opportunity to write about it in the past; Hexxeh made quite a name for himself by offering a USB image that is bootable on more systems, and providing a daily build service to help others try it at home. Google launched a parallel pilot program, delivering to many lucky US citizens an unbranded laptop (called Cr-48) preloaded with the latest build of ChromeOS; initial reports are not overall enthusiastic, due to problems with the Flash plugin and trackpad responsiveness to gestures; in general, many of the initial adopter are perplexed about the real value of such a proposition. And the explanation is simple: it’s not for them. The reality is that ChromeOS is a quite imaginative play designed to enter the enterprise market – and has nothing to do with consumers, or at least it does have only limited impact there. Let’s forget for a moment the fact that the system does have many, many shortcomings and little problems (like the fact that sometimes you are exposed to the internal file system, for example, or that the system is still not fully optimized, or that the hardware support is abysmal). Many observers already commented on the device itself, like Joe Wilcox, Mary Jo Foley or Chris Dawson; what I would like to add is that Google is using the seed devices to collect end user experiences to focus the remaining development effort to create what in the end will be a different approach to enterprise computing – not for consumers. It is not about thin clients: the economics of such devices has always been difficult to justify, with the substantial expenditure in servers and infrastructure; just look at the new refreshment of the concept, in the form of VDI, and despite the hotness of the field, actual deployments are still limited. Activation: you don’t need an engineer to deploy a ChromeOS machine. Actually, anyone can do it, and without the need for any complex deployment server, initial authentication or activation keys. It works everywhere there is a form of connectivity, and as soon as you have completed it, your desktop environment is ready with all the links and apps already in place. It means: no need for large helpdesks (a limited support line is sufficient); no need to fiddle with apps or virtualization desktop layers, you can do it from an hotel room… everywhere you are. Your machine stop working? You activate another. Management: There is no machine management – all activities are based on the login identity, and machines are basically shells that provide the execution capabilities. It means that things like hardware and software inventories will not be necessary anymore, along with patch deployment, app supervision, and all those nice enterprise platform management things that add quite a lot of money to the IT licensing budgeted costs. Security: Since there are no additional apps installable, it is much easier to check for compliance and security. You basically have to log every web transaction on your web app-which is fairly easy. There is still one area that is uncovered (actually, not covered in any current commercial operating system…) that is information labelling, and I will mention it later in the “still to do” area. They need to find a way to bring ChromeOS to more machines. If the enterprise already has its own PCs, they will not throw them out of the window. The ideal thing would be to make it a bootable USB image, like we did for our own EveryDesk, or make an embeddable image like SplashTop. The amount of reinvention of the wheel that is coming with ChromeOS is actually appalling – come on, we did most of those things year ago. Google has to substantially improve management of the individual ChromeOS data and app instances. There must be a way for an enterprise to allow for remote control of what apps can and cannot be installed, for example – to preload a user with the internal links and data shared to all. At the moment there is nothing in this area, and I suspect that it is better for them to develop something *before* initial enterprise enrolments. Come on, Google, you cannot count only on external developers for filling this gap. The browser must implement multilevel security labels. That means that each app and web domain must have a label, cryptographically signed, to claim what “level” of security is implemented, and how information can flow in and out. For example, it must prevent secure information from the ERP application to be copied into FaceBook, or securely partition different domains. A very good example of this was the Sun JDS trusted extensions, unfortunately defunct like JDS itself. This is actually fairly easy to implement in the browser, as the only application that can access external resources and copy and paste between them – and Chrome already uses sandboxing, that can be used as basis for such a label-based containment. This would give a substantial advantage to ChromeOS, and would open up many additional markets in areas like financials, banking, law enforcement and government. So, after all, I think that Google is onto something, that this “something” needs work to mature before it can be brought to the market, and that the model it proposes is totally different from what we have up to now. Noone knows if it will be successful (remember the iPad? Its failure was nearly assured by pundits worldwide…) but at least it’s not a boring new PC. “Q Don’t you think you should develop an open source business model to offer the tools in the first place? The question is: is MS interested in an OSS business model? The answer: we already give out things for free. Well, we can probably thank Richard Stallman for his insistence in the use of the word “free”, but the answer miss the mark substantially. OSS is not about having something for free, and it never was (at least, from the point of view of the researcher). OSS is about collaborative development; as evidenced in a recent post by Henrik Ingo, “The state of MySQL forks: co-operating without co-operating”, being open source allowed the creation of an ecosystem of companies that cooperate (while being more or less competitors) and not only this fact increases the viability of a product even as its main developer (in this case, Oracle) changes its plans, but allows for the integration of features that are coming from outside the company – as Henrik wrote, “HandlerSocket is in my opinion the greatest MySQL innovation since the addition of InnoDB – both developed outside of MySQL”. Microsoft still uses the idea of “free” as a purely economic competition, while I see OSS as a way to allow for far faster development and improvement of a product. And, at least, I have some academic results that point out that, actually, a live and active project do improve faster than comparable proprietary projects. That’s the difference: not price, that may be lower or not, as RedHat demonstrates; it is competition on value and speed of change. Ah, by the way: SugarCRM, despite being a nice company with a nice CEO, is not 100% open source, since that by definition would mean that all code and all releases are under a 100% open source license, and this is not the case. As I mentioned before, I am not against open core or whatever model a company wants to use – especially if it works for them, like the case of SugarCRM. My observation is that we must be careful how we handle words, or those words start to lose their value as bearers of meaning. There is something that I mentioned many, many times: EU projects tend to talk about Open Source, but it is sometimes difficult for project managers to really grasp what OSS is, and how it can be used for real – not only during the project lifetime, but afterwards as well. For this reason, with my thanks to the EU project officers in the Internet of Services group for the invitation, I have prepared a small guide on how to engage open source project, how to evaluate the best exploitation strategy, how to select a business model, and (more important) a simple and pragmatic approach on selecting an OSS license for a new project. The guide will be presented at the Internet of Services 2010 event; the collaboration meeting is in Brussels, tomorrow, and the open source part will start from 11:30. A detailed agenda is available here; for more information, the event webpage is here. Just after the end of the event, the draft of the guide for FP7 project will be mirrored here as well. There is no single development, in either technology or in management technique, that by itself promises even one order of magnitude improvement in productivity, in reliability, in simplicity. As can be seen in the image, there are costs that are related to the integration of COTS (in our case, OSS) within a newly developed product. 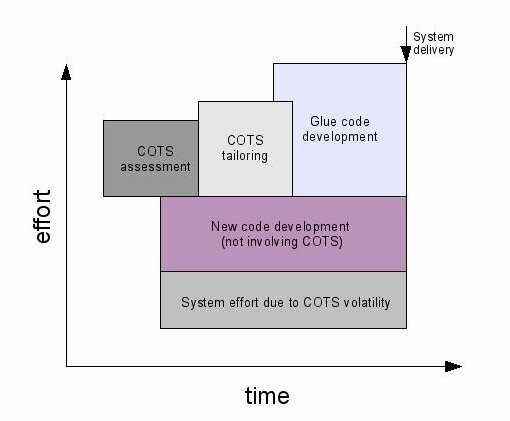 These costs are related to the evaluation (and searching) of OSS, “tailoring” (the adaptation of the code for the project needs), and development of glue code (the layer of code between OSS modules and between OSS and internally developed code). The average company cost of a developer is fixed at 25€ per hour. It should be a reasonable approximation of european costs (in particular, costs in mediterranean areas like Spain, France, Italy, Greece); we know that it is considerably lower than other estimates (especially US ones), but this way we provide a “lower bound” for savings instead of averages. The “tailoring” of code is performed on 15% of the OSS code; percentage comes from several separate projects, with estimates ranging from 5% for mature projects with structured and well-documented interfaces to 20% for complex, deeply-interlocked code like that found in embedded systems. Tailoring cost is higher than traditional coding; for this reason, the COCOMO complexity index is increased to 6 compared to new-code development. Volatility is based on our own model for cost estimation and data from literature on COTS (“Empirical observations on COTS software integration effort based on the initial COCOTS calibration database”, Abts C., Boehm B.W., Bailey Clark E.) and it can be approximate with an average effort equivalent to 1.5 to 2.5 full time person-year. In the case of 10Mlines of code, the saving is estimated at more than 210M€, that is consistent with previous estimates of savings by Nokia in reusing open source within Maemo. Even for the “small” project of 100000 lines, the savings are estimated at 1.2M€. Another interesting aspect is related to staffing and time: not only the use of OSS can reduce development time substantially, but it allows for a substantial reduction in the amount of staff necessary for the development. In the smallest example (100000 lines of code, still substantial) the average staffing is reduced from more than 20 developers to slightly less than 9, bringing this project within reach even by small companies, and in my personal view it explains the exceptional take-up of OSS by new and innovative companies, that even before external sources of capital (like VCs) are capable of creating non-trivial projects with very limited resources. I am always skeptical of the “We’re told” part, as I also remember the “we’re told that all open source is developed by students in basements”, “we’re told that we can give the source code and people will start work on it” and many other, unsubstantiated or out-of-context comments. first of all, there are structural limits in how public listed companies can perform, and how the financial breakdown is performed. If Savio tried to extend his (somewhat limited) analysis to other public companies in the same sector he would have found that most of them are nearly identical in R&D versus SG&A costs, when compared within the same class in terms of market capitalisation. In fact, only startups (that rarely can go to the stock market) have an higher-than-average R&D. Other companies with similar properties are companies in the biochemistry and drug design firms, that have a long incubation period to create a product, and for this reason have a high R&D share. Then, the balance sheet is in itself not a good way to measure the “productivity”, or savings in development compared to same-class companies. In fact, as I wrote some days ago, savings due to the adoption of OSS are not inherently visible in balance sheets, but appear as better quality product or as the capability of producing goods at a lower price point. In fact, just thinking of comparing RedHat with a company that is 55 times larger should provide an idea of how big an advantage is OSS in terms of efficiency. Many companies are helped by the existence of a “trialable” product, and in this sense there may be a core of truth in the idea that cost for customer acquisition may be lower. I am not convinced that cost reduction is so significant, at least not to the same extent of R&D advantages that are clearly easier to measure, and that tend to be significant. I agree with Savio that competition should not happen exclusively on pricing (but it may be a part of a larger strategy), but I contend that by looking just at two balance sheet breackdowns can give us information on whether OSS is more or less efficient in terms of product creation. I continue to believe that in many markets OSS provides a substantial advantage: after all, Rishab et al. estimated the average R&D advantage at 36%; my estimates are from 20% to 75% in specific industrial areas, but in any case substantial. update: Savio added another company (Tibco) which is similar to RedHat size; as before, it shows very similar results. It is my belief that even adding additional companies will more or less show that for software-intensive companies the results will be more or less the same. I also believe that the real comparison should happen outside the financial sheets, by comparing the market: in which markets do the company compete? What is the average size of the competitors? If we can show that on average OSS companies tend to be efficient competitors in markets much larger than their own, then we can show that OSS can give an advantage. If Rishab’s evaluation is right, the 36% increased efficiency should bring the equivalent of a capital advantage of 50% (roughly) so we should check whether RedHat or Alfresco effectively compete with companies that are at least 50% larger than themselves. 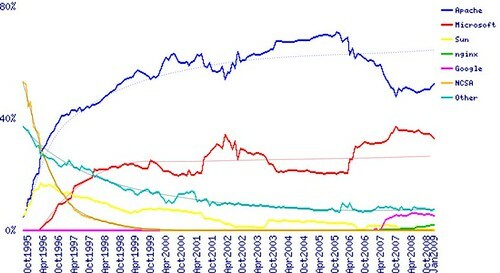 Which is consistent with a traditional Bass Model explanation (data for apache was added to that of Google Web server, that is Apache-based; bicubic smoothing was used to get the trend lines). Diffusion models tend to generate this kind of equilibrium lines, with the market that in a more or less consistent way moves to an equilibrium that changes only when a specific technology is substituted by moving to another, different status. The probability of choosing one technology over the other depends on several factors; a very good model for such adoption is the UTAUT model (some pdf examples here and here), that was found capable of predicting 70% of the variance of adoption success (what it means: that the parameters in the model explain nearly perfectly whether you will adopt a technology or not). The important point to remember: this is about *individual* adoption, not mandated and without external constraints. In this sense, we can use it to predict how a PC owner chooses her web browser, or how a small company may choose which web server to use. The model uses four parameters: performance expectancy, effort expectancy, social influence, and facilitating conditions. performance expectancy: The degree to which a person believes that using a particular system would enhance his or her job performance, or the degree to which using an innovation is perceived as being better than using its precursor. effort expectancy: the degree to which a person believes that using a system would be free of effort, or the degree to which a system is perceived as relatively difficult to understand and use. 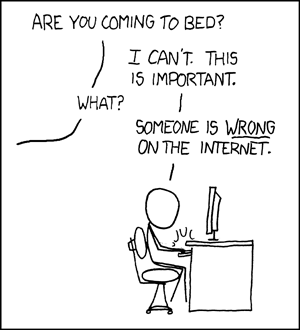 social influence: The individual’s internalization of the reference group‘s subjective culture, and specific interpersonal agreements that the individual has made with others, in specific social situations; or the degree to which use of an innovation is perceived to enhance one‘s image or status in one‘s social system. facilitating conditions: Reflects perceptions of internal and external constraints on behaviour and encompasses self-efficacy, resource facilitating conditions, and technology facilitating conditions; or objective factors in the environment that observers agree make an act easy to do, including the provision of computer support. In the next post, I will present an example of these four parameters in the context of an OSS adoption.